One thing we all can agree on is 2019 will most definitely be a great year for fashion, When it comes to women’s clothing, it’s important to stay up to date on all the latest trends because fashion is a diverse industry which is continuously changing. If you’re less of a Fashionista and more of a normal woman working a 40-hour week like myself, then you might not have time to read through fashion magazines or blogs. All you really have to do is pay attention to what the people around you are wearing, because the very definition of the word trend is, “changes or developments in a general direction”, which is why trends change from one day to the next. At the end of the day, all that really matters is what looks good to you, and on you, which doesn’t require a personal stylist. Here are 3 women’s clothing items that are guaranteed to spice up your wardrobe, all of which you can find at Scout and Molly’s in English Village. No women’s fall collection is complete without a set of leggings, which is why Scout & Molly’s English Village are proud to introduce the Grease Leggings Harvest, designed by Sanctuary, this chic pair of leggings will undoubtedly make heads turn. The leggings come in harvest plaid and feature an elastic waistband, side pockets, back pockets, and are made of a polyester/ rayon blend, which makes them extremely easy to put on because comfort is just as important as style. These leggings are especially great for women like me, who get tired of wearing the same old black colored leggings, its plaid pattern is not only more stylish, but also tends to be more flattering, and will better complement your curves. If you’re looking for a light fall jacket to complete your ensemble, and really make your outfit pop, you should consider adding the Annica Cropped Tweet jacket to your wardrobe. The jacket is designed by Cupcakes and Cashmere, an up and coming Los Angeles family-run design company, who specializes in jewelry and women’s apparel. The jacket features pearlescent buttons, notched lapels, long sleeves, button cuffs, and a double breasted button front, which will give you a look of sophistication, with a fun fall twist. It’s made from polyester, which will compliment your body, giving you a slim silhouette appearance, and goes great with a simple pair of black leggings, and black mid-heel stilettos. The reason I love this jacket is that it not only modernizes a classic plaid jacket, but it also will give you an edgy look. 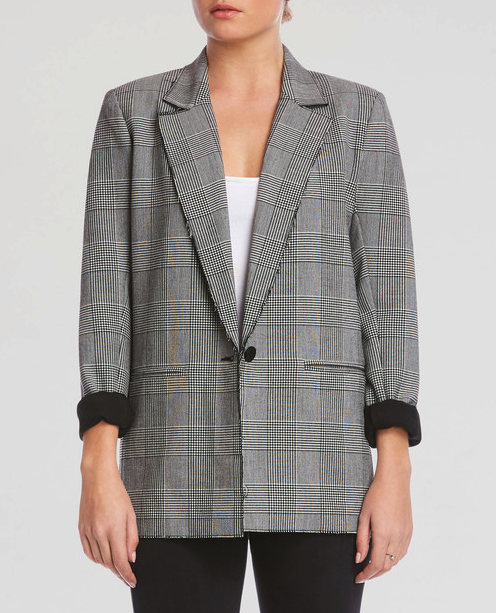 This oversized, grey, plaid jacket features sewn, raw, hem edges, stitched front pockets, a button closure, and is made of 100% polyester, which also slightly stretches. The jacket breathes confidence, and elegance, giving you a look entirely of your own.